US Secretary of State Mike Pompeo says he is "deeply concerned" about the increased production of coca leaf, the raw material for cocaine, in Colombia. At a meeting with Colombian President Ivan Duque, Mr Pompeo said the two countries would try to reduce coca production by 50% by 2023. Colombia has already vowed to step up its coca eradication programme. A recent UN report said the amount of agricultural land used for coca crops in Colombia had hit record levels. The country has fought for years to tackle cocaine production, with the US providing about $400m (£318m) annually to help combat the producers and traffickers. Colombia is the world's largest producer of cocaine, while the US is the world's largest consumer. 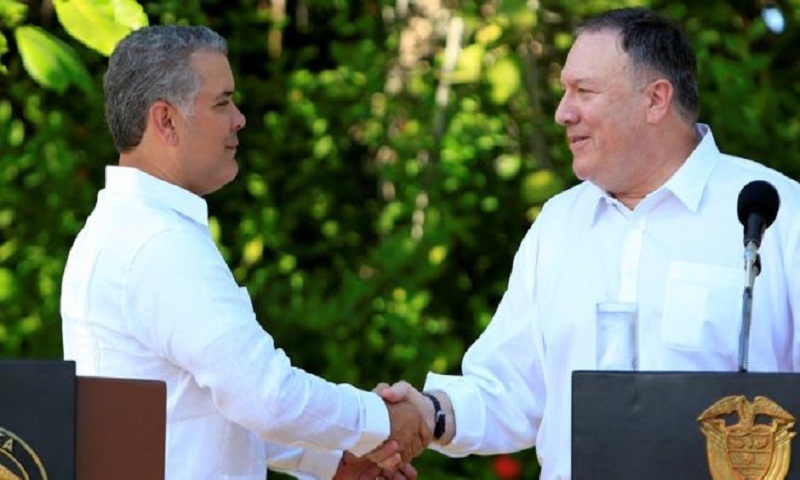 "The United States remains deeply concerned about the surge in coca cultivation and cocaine production in Colombia since 2013, and its impact on each of our two countries," Mr Pompeo said while alongside President Duque in Cartagena. "We know we must do our part to reduce demand in our country and we'll work alongside you here as well." The UN Office on Drugs and Crime (UNODC) issued statistics in September that showed coca production acreage in Colombia in 2017 was the highest ever recorded. The total area given over to cultivation - about 171,000 hectares - was an estimated 17% higher than 2016. The UN said the region bordering the Pacific ocean in Colombia was the most intensively cultivated.